Join Captain Fancy and the crew of the Persephone as they take to the clouds in this riveting steampunk adventure. The Great Atlantic Run is more than a passport to high-flying thrills and excitement; it’s a perilous two-day marathon over the ocean, where only the fast and strong survive. In a journey fraught with air pirates, rough weather and international spies, the risks are sky-high. The rewards, fame and fortune. Take off on the voyage of a lifetime as you explore a grand world of flying ships, steam-powered machines, and incredible characters. 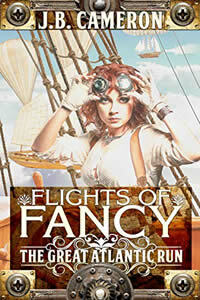 Flights of Fancy is a fast-paced, unforgettable yarn as limitless and unpredictable as imagination itself.